In 1966, James Brown landed his “This Is a Man’s World” song #1 at the billboard and the hit stayed several weeks at the first place. The song was praising all the men for inventing and giving spice to the world and was going like this: “You see, Man made the cars to take us over the road, Man made the trains to carry heavy loads, Man made electric light to take us out of the dark, Man made the boat for the water, like Noah made the ark”. Would have it been in 2011, James Brown would have also sung “Man invented skateboarding, The Maloof Money cup and the Street League”…. Is it difficult to be a girl skater in 2011? You betcha! As the song says, this is a man’s world. But even if a lot of girls that are complaining, this is not new to anybody, although skateboarding was not born macho. There was a time when boys and girls would ride side by side, and if you are not a believer, ask the first Betty… Never mind! 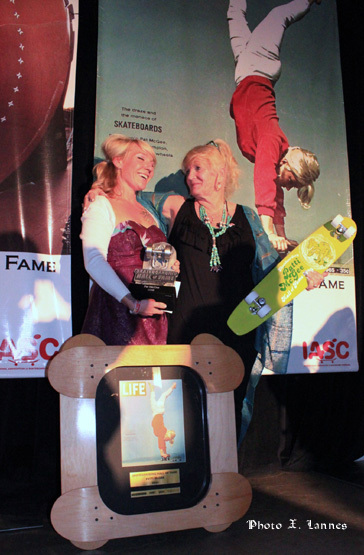 We did it for you and you can read Patti McGee interview on isTia.Tv.… Too bad that the friendship between boys and girls skateboarders ended in the 60’s. After skateboarding died at the end of the 70's, girls like Ellen O'neal, Helen Berryman and all other girls were wiped out from the skateboarding map and it took more than 20 years for the new generation to pop-up with names like Lyn-Z Adams Hawkins, Julie Kindstrand, Lizzie Armanto, Allysha Bergado and now, a flurry of skaters girls hit the pools and grind the copings every day. On the other hand, although skateboarding is dominated by boys, a 2002 study showed that 24% of all skaters were girls. Pioneers included Patti McGee and Peggi Okki. Patti was the first skateboard champ in 1965 and Peggi Oki was the only girl in the much restricted Z-Boys team, the group of skaters from Dogtown that popularized pool skateboarding and later the skater-punk culture. Since then, Peggi has become a well-known artist and her paintings can be seen worldwide. As a mentor for young female skateboarders, she continues to support local and international events involving young women’s skateboarders. After the copycat, the Beautiful, World Champion and legit first Betty ! Now is the time not to ask what the skateboard industry can do for girls, but what girls can do for skateboarding. And they can do a lot! Everywhere, private organizations are popping up trying to uplift the image of girls in skateboarding. It’s definitively the way to go. Don’t wait for the industry big players, they will do nothing but staring at the bottom line of the girls’ division and lamenting that girls don’t sell. They seem to forget that skaters are DIY by nature and that skateboarding empires like Powel-Peralta, Vision Street Wear and Airwalk were annihilated by penniless startups (remember World Industries and the shark loan story?) and gave way to new brands that were promptly annihilated by other startups currently in power. What happened to those behemoths at the end of the 80’s could well again happen in 2012 and who can tell that Silly Girl design or Rogue Skateboards are not the big brands of the future? The rise of girls in skateboarding can be linked to the increased visibility accorded to them in contests. Recently, Girls could be seen in a wide variety of contests that excluded them: like The X-Games, The Maloof Money Cup, The Dew Tour, The Protec Pool Party, The Gravity Games, The Slam City Jam and basically all World Cup Skateboarding contests. The WCS is probably the most supportive organization outside of the girls’ driven associations. The internet also provided a fertile ground where several girls skateboarding group have emerged as part of the subculture, using the web as a tool to disseminate pictures, analysis, comment, reports, contest previews or results thanks to regular websites or blogs. and on The Johnny Carson Show among a list of other accomplishments. Some sites go beyond the mere information relay and organize contests or events or comment on events. Some groups are just webs-sites but some others are non-profit organizations, like the Action Sports Alliance who promotes the advancement of women in skateboarding. The group also allows members to communicate with industry leaders and the general public regarding issues and concerns related to girl's skateboarding. Other blogs like ameliabrodka.com or web sites like Skirtboarders, All Girls Skate Jam, SLAG, Rogue Skateboarding, Chica Rider, GRO, Sk8sisters, The Side Project, are different, yet they all have the same target: how to uplift the image of girls in skateboarding. Female skateboarders also recently became visible in the gaming community thanks to Tony hawk who first introduced Elissa Steamer in his game in 1999. Lyn-Z Hawkins followed suit. So, because the girls are (rightly) feeling they don’t have the exposure they deserve, we decided to do one month’s worth of coverage (actually 6 weeks-until the Protec Pool Party) of the many faces of yesterday and today’s women in skateboarding. In 2010, it seemed girls were finally accepted into the macho world of skateboarding, but then; several incidents showed that the guys were not ready, not yet, to cave in and the clock turned back and girls lost all they had achieve in the past few years. According to ESPN: "After an initial surge in popularity, the women’s vert discipline struggled to sustain a viable competitive tour." As a result, most contests got shut down for girls. The first incident involved the 2009 inductees to the Skateboarding Hall Of Fame who forgot to include a girl in their set. This spurred a mini revolution on several social media websites. 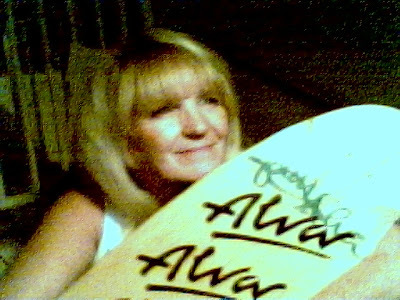 Even if the rebellion acted much like a tempest in a glass of water, it led the following year to the inclusion of the first ever girl inductee at the Skateboarding Hall of Fame: Patti McGee. Then the girls part of the Pro Tec Pool party was cancelled but under rapid fire was immediately postponed to later on the year and 2009 saw the first ever girl only Protec Pool Party. Then it was announced that The Ultra Bowl and the Bowl-A-Rama contests would not include girls. Another blow was the dropping of the girl’s vert on the Dew Tour and the Maloof doing nothing more than the others. And when ESPN announced that women’s vert and superpark would no longer be part of the2011 X-Games, that prompted several girls to complain against ESPN and the macho establishment. In her interview with isTia, Amelia Brodka told me that the response she wrote on her website on the XGames cancellation attracted thousands of readers. The bottom line was that 2011 was left with almost no women’s vert and bowl big contests. Eventually a lot of companies are disengaging of the girl’s business, like Matrix that announced yesterday that the new 2012 line would not include girls.